Optimization for self-production may explain key features of ribosomes, the protein production factories of the cell, reported researchers from Harvard Medical School in Nature online on July 19, 2017. The article is titled “Ribosomes Are Optimized for Autocatalytic Production.” In a new study, a team led by Dr. Johan Paulsson, Professor of Systems Biology at Harvard Medical School, mathematically demonstrated that ribosomes are precisely structured to produce additional ribosomes as quickly as possible, in order to support efficient cell growth and division. The study's theoretical predictions accurately reflect observed large-scale features of ribosomes -- revealing why are they made of an unusually large number of small, uniformly sized proteins and a few strands of RNA that vary greatly in size -- and provide perspective on the evolution of an exceptional molecular machine. 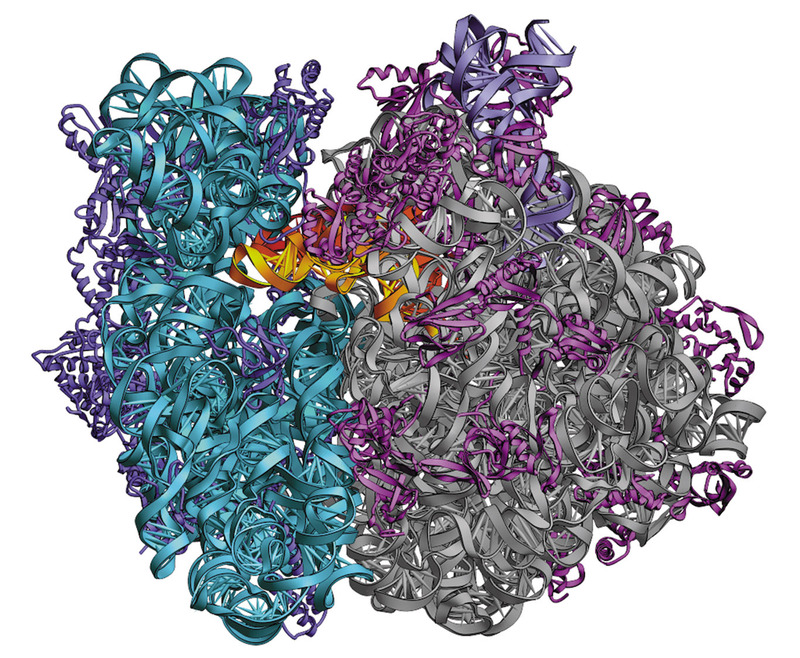 "The ribosome is one of the most important molecular complexes in all of life, and it's been studied across scientific disciplines for decades," Dr. Paulsson said. "I was always puzzled by the fact that it seemed like we could explain its finer details, but ribosomes have these bizarre features that have not often been addressed, or, if so, in an unsatisfying way." Every living cell, whether a single bacterium or a human neuron, is a biological system as dynamic and complex as any city. Contained within cells are walls, highways, power plants, libraries, recycling centers and much more, all working together in unison to ensure the continuation of life. The vast majority of these myriad structures are made of and made by proteins. And those proteins are made by ribosomes. In saliva, scientists have found hints that a "ghost" species of archaic humans may have contributed genetic material to ancestors of people living in Sub-Saharan Africa today. The research adds to a growing body of evidence suggesting that sexual rendezvous between different archaic human species may not have been unusual. Past studies have concluded that the forebears of modern humans in Asia and Europe interbred with other early hominin species, including Neanderthals and Denisovans. The new research is among more recent genetic analyses indicating that ancient Africans also had trysts with other early hominins. "It seems that interbreeding between different early hominin species is not the exception -- it's the norm," says Omer Gokcumen, PhD, an Assistant Professor of Biological Sciences in the University at Buffalo (UB) College of Arts and Sciences. "Our research traced the evolution of an important mucin protein called MUC7 that is found in saliva," he says. "When we looked at the history of the gene that codes for the protein, we see the signature of archaic admixture in modern day Sub-Saharan African populations." The research was published online on July 21, 2017 in Molecular Biology and Evolution. The study was led by Dr. Gokcumen and Stefan Ruhl, DDS, PhD, a professor of oral biology in UB's School of Dental Medicine. The open-access article is titled “Archaic Hominin Introgression in Africa Contributes to Functional Salivary MUC7 Genetic Variation.” The scientists came upon their findings while researching the purpose and origins of the MUC7 protein, which helps give spit its slimy consistency and binds to microbes, potentially helping to rid the body of disease-causing bacteria. As part of this investigation, the team examined the MUC7 gene in more than 2,500 modern human genomes.